1. What are the differences between Sidify and other Spotify converter tools? 2. I have received the code. How to register Sidify? 3. What can I do if I get the message "Invalid Code" when trying to register? 4. Why can I only convert the first 3 minutes of each audio? 5. What kinds of music does Sidify support converting? What output format can it export? 6. What's the function of "Intelligent Mode"? 7. Can I convert the entire playlist from Spotify? 8. How to automatically store the output audio into Artist / Album folders? 9. The output audio quality is unsatisfied, how to improve the output quality? 10. The volume of some converted songs are lower than the volume of original ones. Is there any way to improve it? 11. What can I do if Sidify program shows “Spotify is not found..." or "Couldn't find Spotify client..”? 12. How to submit feedback through Sidify program? Sidify Music Converter for Spotify is the fastest Spotify Music Converter on Mac & Windows which can convert Spotify Music at 5X faster speed as well as keep 320kbps quality than other DRM removal programs do. Furthermore, it can also keep ID3 tags after converting. Run Sidify and click " " button, you will get the registration window. Copy and paste the registration Email and Code into the registration pop up dialog. Fill the two blanks with your registration Email and product code you have received from the email. Then click OK.
 First, please make sure that you have downloaded the right program. If you are sure that you are running the right program and following the direction but still get the error message, please contact our support team via support@sidify.com for help. Important Notes: Since Jan.19th, 2017, Sidify Music Converter for Windows adopts a new registration mechanism. 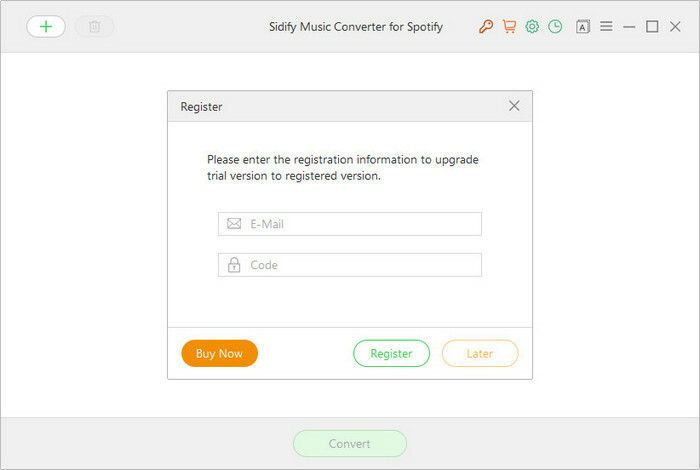 New users who purchased Sidify Music Converter for Windows are required to register the program with Email address and registration code. For old users, it's still available to register with registration name and registration code. It's the limitation of trial version, which only allows trial users to convert first 3 minutes song for sample testing. To unlock this restriction, please purchase a license. Now, Sidify Music Converter for Spotify is specially designed for converting Spotify song, playlist, podcast and radio to MP3, AAC, WAV or FLAC format. Intelligent Mode is a combination of Spotify Record Mode and YouTube Download Mode. When you choose "Intelligent Mode" in Sidify setting window, the conversion rate would be increased a lot thus you can get the Spotify tracks as needed. Tip: If you want to convert a playlist with more than 100 songs, we suggest you should open the playlist on Spotify, select the individual tracks in the playlist and drag & drop all the tracks to Sidify program for converting. Or we suggest you'd better create some new playlists and separately add them for converting. Before converting, you can choose to sort the output music files into folders by "Artist/Album", "Artist", "Album", "Artist/Album" or "None" in Sidify setting window, so that the files would be organized properly. Please contact our support team at support@sidify.com for help. Try to provide us with a converted music file for testing. Please tell us which conversion mode are you choosing? (Spotify Record mode or YouTube Download mode?). If you want to download the songs in full volume, we suggest you can change the setting in Spotify. 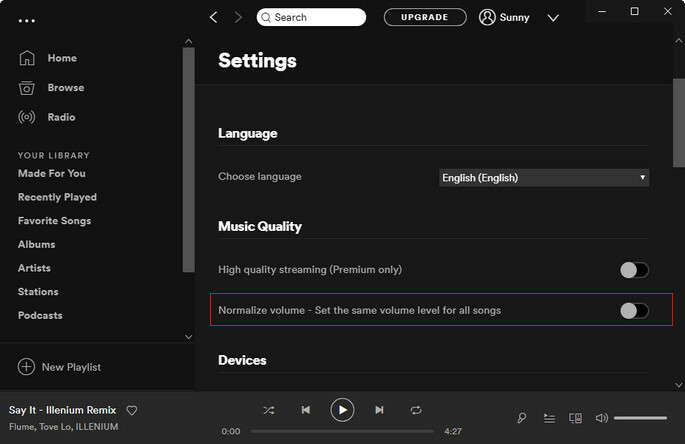 The most important thing is to uncheck the "Set the same volume level for all songs“ box in Spotify. 11. How to submit feedback through Sidify program? 12. What can I do if Sidify program shows "Spotify is not found..." or "Couldn't find Spotify client.." ? The latest version of Sidify Music Converter for Spotify is fully compatible with the Windows 10 Store version of Spotify. Please check for update or directly download the latest version of Sidify program through: Sidify Download Center. 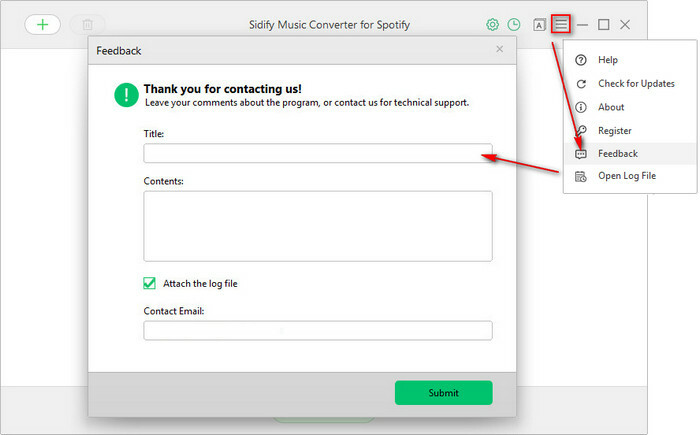 Note: If multiple devices are logged into the same Spotify account, please make sure you are selecting "This Computer" to play the audio on Spotify when downloading Spotify music with Sidify program. Tip: If you were manually launching Spotify App, please re-launch Sidify program for a try. Solution 2: If your Spotify crashes after clicking "Convert" button, we suggest you switch to "Intelligent Mode" or "YouTube Download" mode. 1. Which Windows OS are you using? 32 bits or 64 bits? 3. Please send us two log files of Sidify. You can find them by going to the Sidify program, Menu > Open Log File. They are called log.txt and record.log.